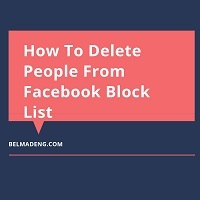 How To Delete People From Facebook Block List: Looking for the steps on how to remove someone from your Facebook blocked list? Facebook has a feature that lets you block and unblock people on the site. These Facebook block and unblock features help you secure your timeline to some extent. When you hover about Facebook to block someone, the person is immediately removed from your friend lists and placed in your blocked list. From this Facebook blocked list, you can view all the friends you have blocked and unblocked them if you so choose. Unblocking on Facebook helps you delete people you've blocked from your block list. In this post, you'll see how to locate all the friends you've restricted from seeing your timeline on Facebook and the steps you need to follow to delete them from the list. The steps to locate your Facebook blocked users is very simple. All you need to do is to log in to your Facebook account and do the few things we shall be sharing with you here. 1. Go to the top right corner of any Facebook page and click on the V-like shaped icon and a drop-down menu will show up. 2. Select Settings from the drop-down menu to continue to your Facebook account settings page. 3. Next, click Blocking in the left column of the page that appears. This will open the manage block page. 4. Scroll down to the Block Users section and you should see all the persons you've blocked on Facebook. 6. Now, locate and click Unblock next to the name of the person. 5. Navigate to the block users option and click unblock next to the name of the individual you want to delete from the "blocked users list." That is how to delete people from your Facebook block list using your desktop or laptop computer. 2. When you log in to your Facebook news feed, scroll to the top right corner for Android users or to the bottom of the page for iPhone device users and tap the three-parallel-lines icon. Bear in mind that if you unblock someone, you won't be able to block them again for a few days. That is how to delete people from your Facebook block list using mobile devices.